Help reduce your engines temperature and boost horsepower with the JET Performance Low-Temp Thermostat. It's important to know that reducing engine temperatures with a low-temp thermostat not only adds life to your engine but also provides a denser air/fuel mixture which helps produce more horsepower. Consistent control of engine temperature allows an engine to operate at its peak efficiency no matter what the driving conditions. The factory 195° thermostat simply cycles open and closed, this reduces cooling efficiency in any engine. With the JET Performance 180°Low Temp Thermostat you get consistent engine cooling and a precise metering of water throughout the engine. The JET Performance Low-Temp Thermostat is constructed of stainless steel. Does JET Performance 10170 fit your vehicle? 10170 is rated 5.0 out of 5 by 3. Rated 5 out of 5 by reyemgetO from Works as advertised Put this in my 93' Silverado 350 tbi. The truck runs at a noticeably lower temperature now considering the stock thermostat opens at 195 degrees. 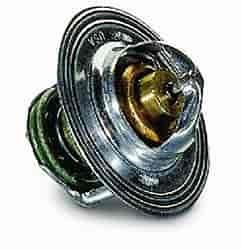 Great quality but does not come with a gasket like other thermostats I have purchased.